Just a few years ago, the field of contemporary Latin American art could claim only about half a dozen essayists: Damián Bayón, Luis Cardoza Aragón, Jorge Glusberg, Jorge Romero Brest, Raquel Tibol, Marta Traba, and a few others. In a sense, the Buenos Aires-Mexico City axis had a monopoly on theoretical thought in the Latin American visual arts scene. The dawning of the third millennium, though, ushering in the Latin American Forums of Meiac de Badajoz – directed by Gerardo Mosquera – and the Diálogos Iberoamericanos – co-directed by Fernando Castro and Kevin Power – , has permitted us to familiarize ourselves with the new Latin American essayists in the arts: Gustavo Buntinx, Olivier Debroise, Ticio Escobar, Ivo Mesquita, Cuauhtémoc Medina, Iván de la Nuez, Justo Pastor Mellado, José Roca, Ana Tiscornia, and others, many of whom are included in the anthology Critical Thought in New Latin American Art, edited by Kevin Power (2006). I think it’s important to situate Alanna Lockward in this context. 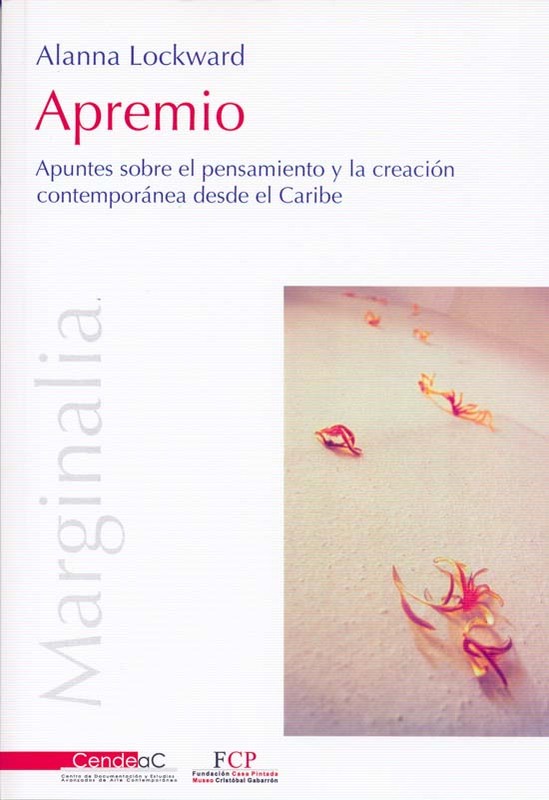 Author of the book Apremio: Apuntes sobre el pensamiento y la creación contemporánea desde el Caribe (Pressure: Notes on Thought and Contemporary Creation from the Caribbean) (Cendeac, Murcia, 2006), Lockward is a Dominican art critic, cultural journalist, and curator of exhibitions who has been professionally active in Santo Domingo, Port-au-Prince, Miami, New York, and now Berlin. The book Apremio is an anthology of diverse texts drawn from Dominican (Cariforum, El Listín Diario), American (The Miami Herald), and Spanish (Atlántica) publications throughout the past ten years. It is not a book about art as such; rather, it is an entire repertoire of catalogue texts, newspaper interviews, and profiles of Caribbean writers, filmmakers, dancers, poets, artists, and others. Given that Caribbean thought – from art critic Guy Pérez Cisneros to essayist Edouard Glissant and including José Lezama Lima’s writings on art – is little known in the European cultural context, Alanna Lockward’s anthology is welcome indeed. As an essayist, the author is at her most convincing when writing on contemporary Dominican art (“Los Noventa en Santo Domingo. Un Anecdotario” [“The Nineties in Santo Domingo: A Collection of Anecdotes]”), African art (“La era de la Negritud” [“The Era of Négritude”]), and Caribbean art (“Caribe X-céntrico” [“Caribbean X-centric”] and “Monedas al Aire” [“Coins in the Air”]); these essays reveal comprehensive knowledge, commitment, and discernment regarding a topic that she has studied extensively, critiqued, and taken responsibility for as curator of exhibitions (for example, Pares & Nones. Fotografía Contemporánea de Haití y República Dominicana [Evens & Odds: Contemporary Photography from Haiti and the Dominican Republic]). Particularly lucid is her critique of the exhibition Caribbean Visions (1995) at the Center for Fine Arts (now the Miami Art Museum), denouncing reductionist readings of Caribbean art made from a “gringo” point of view: “This ambitious curatorial and museographic effort is, without a doubt, rife with documentary inconsistencies, phantasmagoric apparitions and interpretive errors”. One cannot argue with the author once she reveals that the contemporary selection of the exhibit was limited to José Bedia, Luis Cruz Azaceta, Edouard Duval-Carrié, José García Cordero and Arnaldo Roche Rabell, omitting, for example, Jean-Michel Basquiat. Also outstanding is Lockward’s commitment to gender issues at large; her interview with Dominican writer Chiqui Vicioso stands out in particular, in which she quite rightly exposes the dismissive European notion of Caribbean women as “exotic”, affirming: “All Caribbean women, apart from being ‘pajonúas’ [natural hair advocates], ‘nymphomaniacs,’ and great in bed, also write interesting literature”. 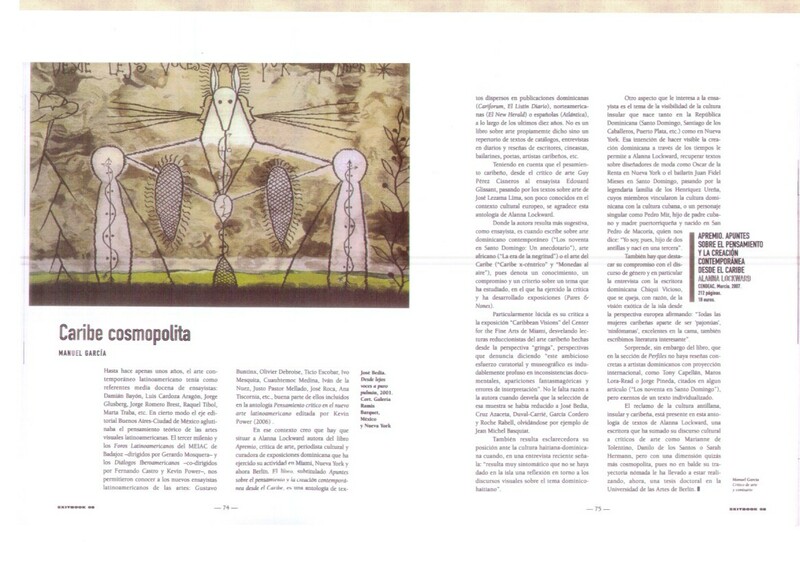 It is surprising, nonetheless, that the “Profiles” section of the book contains no specific portraits of Dominican artists with international stature, such as Tony Capellán, Marcos Lora-Read and Jorge Pineda, who are cited in passing (“The Nineties in Santo Domingo”) but have not been allotted their own texts. The self-assertion of the culture of the Antilles, of the so-called “insular Caribbean”, is present throughout this anthology of texts by Alanna Lockward, a writer whose cultural discourse compares to the likes of art critics Marianne de Tolentino, Danilo de los Santos and Sarah Hermann, but with a somewhat more cosmopolitan dimension; this is quite understandable, considering that her extensive nomadic trajectory has now led her to pursue a doctoral degree in the Department of American Studies in the Faculty of Philosophy of Berlin’s Humboldt University. Published with permission of the author. First edition: Exit-Book, a biannual review of books on art and visual culture, No. 8. Madrid 2008. Also reviewed by Ineke Phaf-Rheinberger. 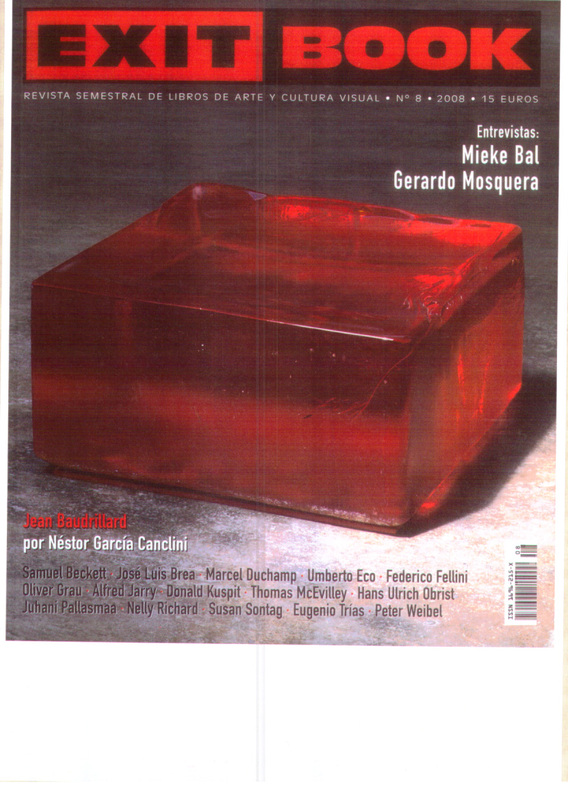 In: Iberoamericana 23. América Latina-España- Portugal. Ensayos sobre letras, historia y sociedad. Notas. Reseñas iberoamericanas. Madrid-Berlin 2006. P. 270-272. Apremio. Apuntes sobre el pensamiento y la creación contemporánea desde el Caribe. CENDEAC, Murcia 2006. 212 pages. Out of print, available in selected libraries. Es para mi un orgullo ! ver a mi amiga y hija por eleccion, lograr su sueno! es facil mantenerte en el camino . Felicidades !!! y viva la Republica Dominicana !!! Que te vio nacer y te dio toda la materia prima para ser quien eres !! !